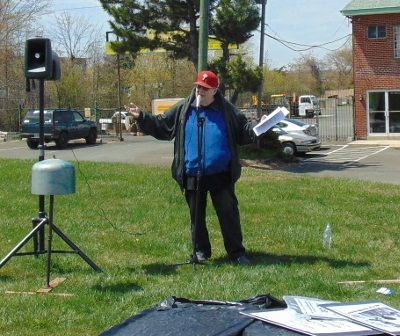 The Brandywine Peace Community called upon Pennsylvania's new Governor, Tom Wolf, to hold hearings upon the Drone Command Center at the Horsham Air Guard Base (About 20 miles directly North of Philadelphia, it replaces the old Willow Grove Naval Air Station). There has, as yet, not been a single citizens hearing on the drone war command center announced in March 2013 and is training computer operators for drone strike against people thousands of miles away. Governor Wolf can initiate these badly needed hearings into drone warfare activities coming from PA. 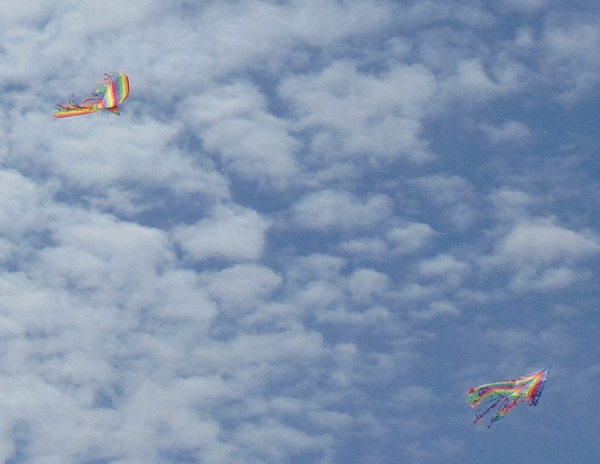 Protesters decided a while back to adopt the slogan "Fly Kites, Not Drones," so here are the kites. "When you're using that kind of a weapon that relies on surveillance, it means that, first of all, you're violating the privacy of many people – a village, a whole region," Mottern said. "That kind of violation is totally against international law. It's against the universal declaration of human rights that was approved by the United Nations. Even before the killing occurs, you have a situation people's rights have been profoundly violated." “...drone strikes represent a tremendous advance in air warfare since World War II and Vietnam, when U.S. bombers would have to drop tons of ordnance to take out one target. But the collateral damage is still consequential, even if not as great as wiping out whole villages would be. Overall, The Guardian counts 1147 casualties in return for strikes on 41 suspected terrorists. Generally, it takes about 28 civilian casualties to eliminate one terrorist leader. Any particular killings by drones that the White House regrets? Actually, yes. In January 2015, two al Qaeda hostages were killed by a drone strike in Pakistan. Watching the coverage of these tragic deaths, a viewer would be left with the impression of a drone program that has had a stellar record of accuracy up until it unfortunately killed two innocent people. But, in fact, killing innocent people has been a central part of the drone program from the very beginning, and is in many ways an inescapable consequence. It's not that a perfect program finally slipped up. Rather, a program that has killed somewhere between 400 and 1000 civilians in Pakistan alone finally killed an American civilian, to whom no wrongdoing can be even tangentially attributed. How precise are drone strikes? In fact, these are not as precise tools as you might imagine. Despite having a descriptor that most Americans associate with exclusive, high-end service, "signature strikes" are actually much less exacting than "targeted strikes." "Signature strikes" are probably better known as "firing into a crowd of people and hoping for the best." What they mean by "signature" is quite revealing. According to the U.S. theory, insurgents can be identified from above merely by the nature of their movements. A convoy of Toyotas with guys in the beds carrying guns presents a certain signature on the ground, tipping off a drone operator that bad guys are coalescing. We strike them without knowing their names, their affiliations, their motives, or sometimes anything more than where they were walking or driving. Problem is, this “signature” also fits wedding parties, which have suffered numerous attacks. How about the opposition party? The guys who stand in the way of just about every Presidential and Democratic initiative? Asked in interviews whether the killing of an American citizen should cause the United States to reconsider its use of drones against overseas combatants, GOP lawmakers said unequivocally that it should not. 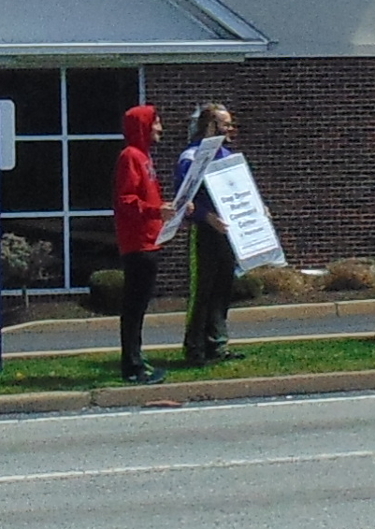 Membes of Brandywine Peace Community in front of a nearby church. 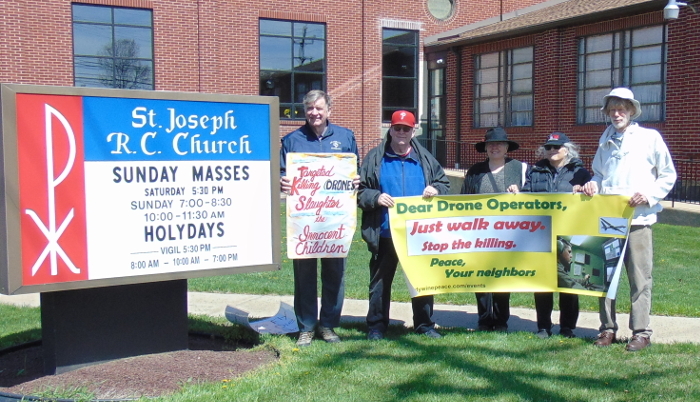 So is there any way for the peace movement to make an sort of impact on drone use? Defense One says the US really needs a better procedure, a legal framework, for carrying out drone strikes. As American citizens are joining ISIS, they're increasingly at risk for getting killed in done strikes. ...lawyers across the ideological spectrum have challenged the Justice Department’s legal reasoning. In particular, critics argue that secret and internal executive branch review, however painstaking and careful, does not satisfy the Fifth Amendment, which provides that no person shall be deprived of life without due process of law. Now is the time to address the questions President Obama has raised. We must seize the opportunity to institutionalize a more transparent and dispassionate process, defend the hallmarks of due process, and affirm that neither the executive branch nor U.S.-born terrorists are outside the law. We recommend a fine-tuned version of the second approach raised by President Obama: an independent, executive branch review panel designated to assess the evidence against proposed targets and make non-binding recommendations to the President as to whether the targeting is appropriate before efforts are made to kill the targets. One candidate for such a panel is the existing Privacy and Civil Liberties Oversight Board, an independent, bipartisan agency in the executive branch.